I do love E.l.f cosmetics – they even one my ‘best cheap brand’ category of 2010. I don’t think there’s a better place to spend a fiver as they not only produce cheap products that look fab, but they do they job intended well too. I’ve tried a few of their accessories before and have always been pleased, but now they’ve gone ‘green’ there’s even more a reason to get excited! 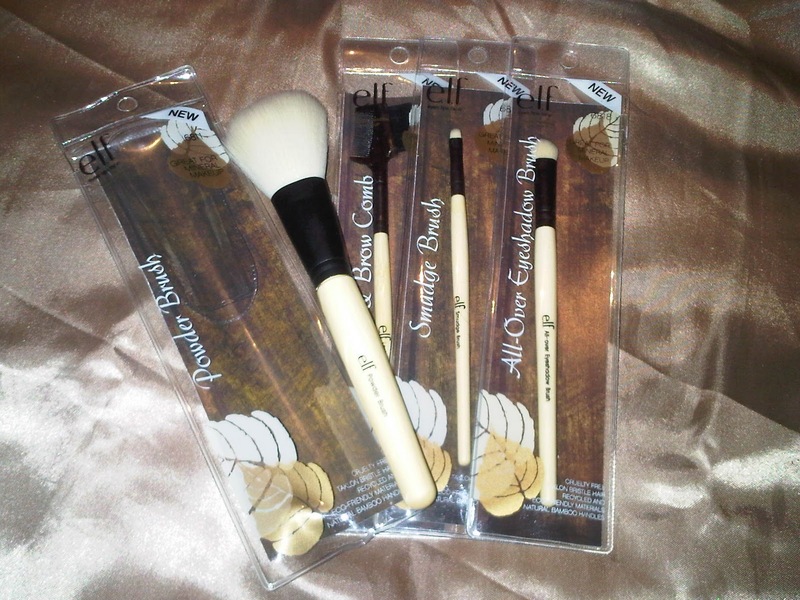 I’ve got the smudging brush, all-over eyeshadow brush, powder brush and the eyebrow comb. 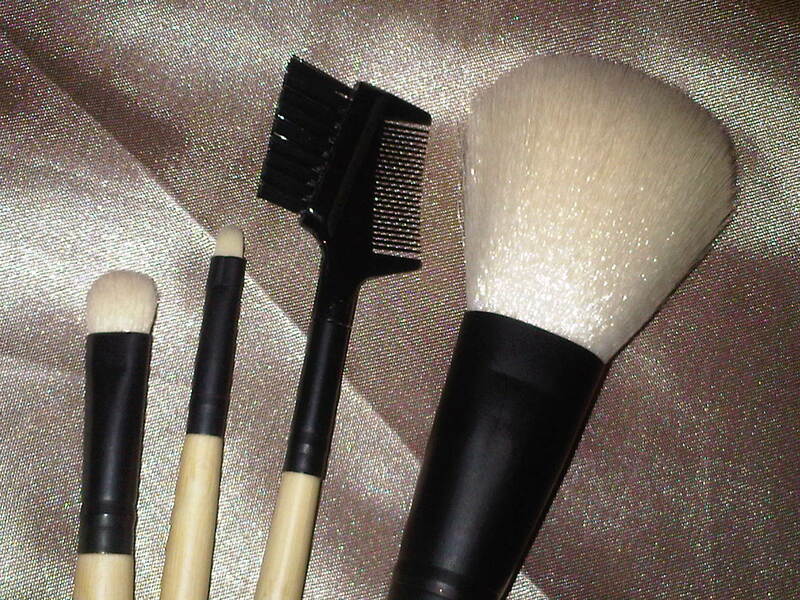 These brushes are a little more expensive at £5.50 each, but you’re paying for the benefit of doing some good. The quality is to be expected – generally good for such a cheap price and incomparable with anything similar you’d find on the High Street. The bristles are very soft, which does prove a bit problematic with the poofy face brush as you really have to spend time building up coverage as it’s a bit more difficult to get product on the brush. The bristles are pale so the product does ‘cling’ and make them look dirty really quickly, but this just means you have to use your E.l.f brush cleaner more regularly! 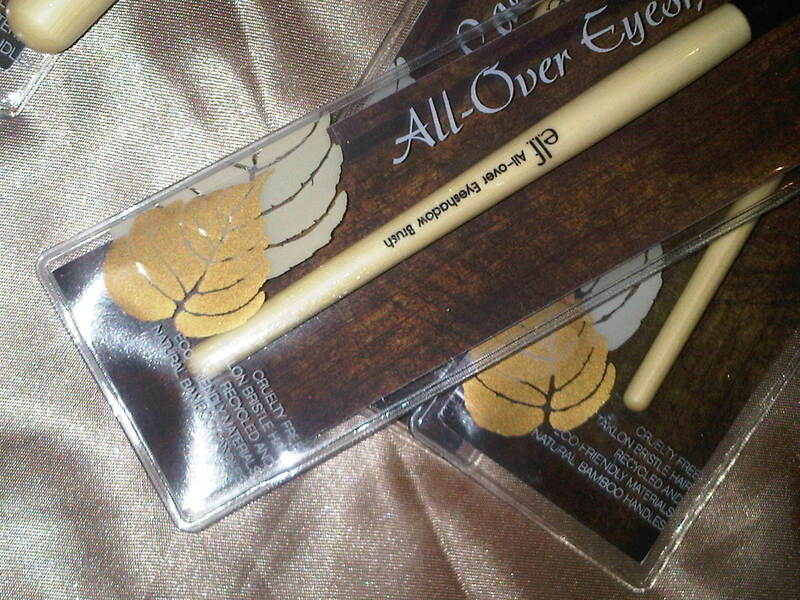 I love the fluffy eyeshadow brush as it makes it easy to create a great base colour. The smudging brush is really teeny, but perfectly sized to do some serious smudging and move the product around effectively. The eyebrow comb is a regular comb, but the long handle makes it easier to manoeuvre and the comb can be used even over dried mascara. Overall I think these brushes are good quality for the price. I love the look of them and think they do the job well. 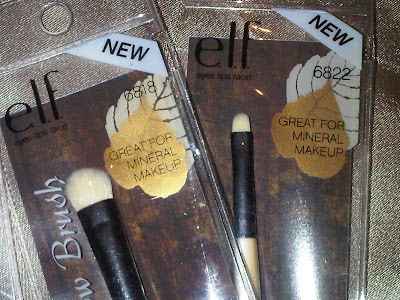 It’s an absolute bonus that they’re ‘green’ too, but there’s a big difference between the price of these (£5.50) and the regular brushes (£1.50) so you’ve got to want to get your hands on something a bit better that makes you feel warm and sunny inside! Another thumbs up from me…. get your hands on them from next month. I definitely wanna try the all-over eyeshadow brush and the blending brush from this line! : D Thanks for the review! I think the eyshadow brush is my fave : ) Let me know what you think if you do pick some up!